Chipotle Protest – July 25th – Dupont Circle! 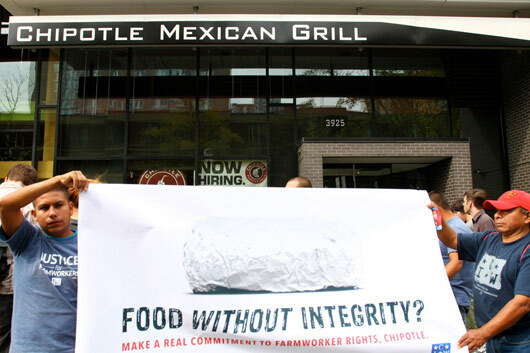 The CIW has officially begun its campaign against Chipotle, asking them to sign the Fair Food Agreement. The Chipotle campaign is a campus centered campaign that focuses on students and to engage with the Campaign for Fair Food. Come out for a dynamic, educational and peaceful action! Everyday, we as students, customers and consumers are deceived by the fast food industry to make us believe that we are eating just and healthy food. Chipotle is no different – read on to learn about how Chipotle lies to its customers everyday! Attend on Facebook: Chipotle, season your salsa with justice! as always, visit the CIW website today for more information! New video from the Giant action!